Avoiding emotions, rejecting feelings, and retreating into food in the process of fleeing is a big part of being a first-class emotional/stress eater. Addiction comes into play because the food becomes the solution for everything. It's easy to get addicted to solutions, right? There's a major problem with that because the dive into the food isn't a solution at all. Even though time and time again we're capable of convincing ourselves this time will be different...and when it isn't, it's "that's the last time," until the next time, of course, then that becomes the last time. I'm convinced that my emotional development has been stunted my entire life. Whenever I started avoiding emotions/feelings--and escaping into the food, is when I stopped learning how to properly handle emotions and feelings. Granted, I've learned a lot in the last ten years and my daily practice makes it very hard to avoid emotions and feelings, so I feel 'em without the food--and sometimes the feelings or emotions are processed in irrational ways. Sometimes the processing of emotions and feelings can come out sideways because they're either turned up way too high or too low. Why? Because I have more than three decades of experience in avoiding feelings and emotions and only one decade worth of experience in practicing actually allowing them to process. When I write about this "daily practice" it isn't just about the food. The practice includes so much more than food plan boundaries, believe me. For those like me, we're learning about so much more than creating a food plan that keeps us well. We're learning how to live. We're learning how to develop our spiritual lives. We're learning how to accept. We're learning how to love. We're learning how to forgive. We're learning how we can survive and move through turbulent emotions and uncomfortable feelings. We're learning how not every crisis is the end of the world. We're learning how some things we didn't consider before, do need considering--nurturing, and loving. I've said it a thousand times: "I don't diet." And I don't. Diets don't go deep. Diets, for someone like me, at best, become a cartoon character band-aid on a chronic and deadly disease. We can survive. We can thrive. We can live, love, feel pain, feel joy, forgive, do things differently--and we can make it---and we can reach a healthy body weight along the way--but it comes, ultimately, in my opinion, because we're willing to broaden our perspective beyond a diet mentality and into something deeper and more powerful. I don't have good willpower. I'm not the best at impulse control. On the surface, you might think those are two things needed for long-term weight loss and maintenance. Good thing they are not because if so, I'd be 500 pounds right now. I do have a daily practice. It isn't perfect and it doesn't have to be perfect--it simply must be practiced. Some days are better than others. But isn't that life? Someone much wiser than me once said, "Life is 10% what happens and 90% how you react to it." In life, attitude and perspective is everything. In this journey, attitude, perspective, and acceptance--all tempered with a code of self-honesty and an open mind, becomes the difference between having a consistent measure of peace and calm or having consistent chaos and insanity. I went back into the archives to exactly one year ago and started reading--that's what inspired tonight's post. Today was challenging in several ways. My production load and responsibilities at work are super high at the moment and that makes for long days, plus I've decided to stop avoiding a couple of hard decisions I must make very soon. Sorry to be vague--but the issue isn't important to discuss. What is important is the fact that sometimes things and people need to be dealt with head-on---and if you're like me, avoiding these confrontations can eventually lead to a breach in a recovery plan. Pure and simple-- if important things are avoided, they don't just go away--their presence becomes heavy as they grow and it becomes more difficult to hold them down. I do not want to stuff it down with food. That's what I did for years. Instead, I'll deal directly; releasing the weight of avoidance. 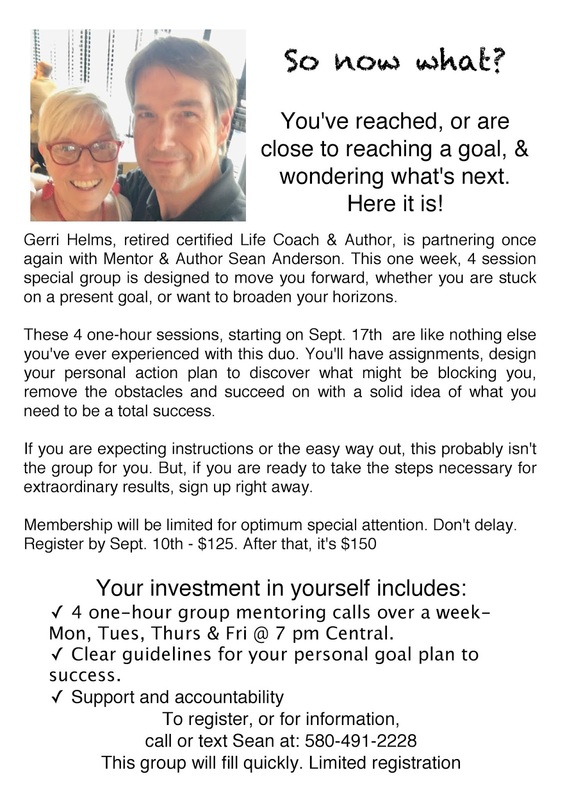 Signups continue for the very special four day/four-hour intensive I'm co-facilitating with Life Coach Gerri Helms! I made an effort to exceed my daily 64oz water goal and I did it. It wasn't really too much of a challenge--it was more of just deciding to do it and picking up the glass a couple more times than usual. Okay then, I need to discover what else I can decide to do! I try to keep it short here on Wednesdays in consideration of my schedule. So I'll wrap this up quickly. I do want to say a big thank you for the questions and sign-ups for the upcoming four-day intensive conference call workshop I'm co-hosting with Life Coach Gerri Helms! The intensive starts the evening of September 17th at 7pm Central/8pm Eastern and continues Tuesday, Thursday, and Friday at the same time that week. Here's what Gerri says about this workshop we're calling, "Now What?" Gerri Helms: "Sean is jumping out of his comfort zone to explore goals with me. SO many people just can't get started on their own. Considering a career change? Entrepreneurship? retirement? Becoming a coach or motivational speaker? This might just be the launch you've been looking for. This isn't about weight loss although that may be a goal for some of our participants. You are welcome to text or call me too for more information 407-274-0519." Maybe you want to write a book? Long before Gerri and I started facilitating support groups together, she was a weekly coach for me through the process of writing the manuscript for my book. Okay--you've decided not to wait another day and you're ready to create an action plan. Now what? Call or text us with questions and/or to request a registration! My number is 580-491-2228. Today was a long work day. I left the studio late this afternoon and headed straight for the grocery store for a few needed items--and a coffee, of course! I spent a little time this evening at the watch party of the now Senator-elect Coleman. He owns the broadcasting company I call home. He ran a good campaign from start to finish. It was good to see him with a look of victory and relief on his face. He's been rather tense of late! I enjoyed a late dinner. I'm no stranger to late dinners. I fired up the grill for a petite sirloin and pan prepared sweet potatoes--one of my favorite dinners, for sure! I sincerely appreciate all of the positive messages about last night's extended blog post. I don't do one like that every night-- sometimes it's just a recap of the day, but when I do dive into a particular topic, I thoroughly enjoy the exploration! Okay--I better drop in bed! 4:30 alarm comes quickly! Today was a crazy Monday in radioland! But-- it was okay, I'm grateful--I have a job where I get to use my creative side and my natural abilities--and truly, that's a blessing! I hosted a special conference call Q&A tonight with Dr. Marty Lerner. The talk tonight was the finale to a book discussion group exclusive to the support groups I facilitate. It was over-the-top wonderful! If you haven't requested your free copy of Dr. Lerner's book, I highly recommend doing just that at www.milestonesprogram.org The free book offer is prominently featured on the site's homepage. No catch, no sales pitch--just an amazing and potentially life-changing free book for anyone who invests the time and consideration of its seven chapters. I discovered my limit on turkey breast. Uh, maybe 5oz. LOL I put 8oz on my plate tonight and it was way too much. I mention this because it's a perfect example of eyes bigger than stomach--and also, just because it fits within the food plan and budget doesn't mean I need to pile it on! I'm not sure when the switch occurred. Looking back, I suppose you could say it happened after my initial weight loss, and right as I started the turnaround from my 164-pound relapse/regain. The switch arrived at just the right time. I'm talking about the switch from DIEting to LIVing. Yeah, I don't "diet." I didn't "diet" while losing that 164-pound regain and I don't "diet" in maintenance mode. I live each day with a plan, a style of eating that fits me--and one that's conducive for a healthy body weight. Diets don't work because it's a means to an end. Have you ever attempted a diet that was so restrictive and gross--but you did it anyway because you knew it would succeed in dropping the weight? But you hated it the whole time--dreading it each day, white-knuckling through it--and fantasizing about the day when you'd reach the pre-determined goal so you could be done with the diet, whatever it is/was? Me too. If what we're doing is a temporary diversion from who we are in the behavioral patterns that brought us to our heaviest in the first place, then as soon as we return to "being ourselves," with the internal patterns, experiences, actions, and coping mechanisms on which we've grown dependent, the weight comes back--every time, with rarely an exception. When I looked for an external solution to my internal issues, it always ended in a bad way. I still like my disgusting analogy for diet mentality: It's like calling a cleanup crew to the sewer line break instead of calling a plumber to repair the sewer line. It's interesting, our whole lives, people often tell us to "just be yourself," yet, when it comes to losing weight, the advice or plan is often: "Here's the latest fancy diet plan, product, or procedure, do it. It works," with little consideration for the divide between who we are and what it requires us to be. Basically, don't be yourself...be something you perceive as "better than" yourself...and here we go into another direction promoting self-loathing as soon as we don't somehow conform or live up to this "better plan." Binge eating, compulsive overeating, and the resulting morbid obesity ARE NOT MORAL issues. But the old diet mentality would have us believe it's so. I refuse to share some of the most brutal things I've told me about myself over the years--all because I couldn't "get it together," somehow. The least of it involved the word "failure," the worst--well, you can imagine, I'm sure. I would never speak to someone or treat someone the way I've spoken to and treated me...ever. But--the search continued for the next thing--the key to my weight loss success--the next best diet plan--something, anything that would work--and I was desperate---and as long as that search continued, I felt justified with my food behaviors. Maybe the solution I needed hadn't been invented yet. What could I do? This search for the next best thing is what fuels a 100-Billion dollar weight loss industry. When our personal truth is finally recognized, acknowledged, and embraced, the search can abruptly end. It's like an exhausting search for a missing car key that comes to an end when you realize the key was in your coat pocket the entire time. I've witnessed this happen with numerous people who reach in, grab the key--insert the key--and head in a direction with a consistency they've never known... and they do it without the next best-latest-greatest-wonderful-sure-fire, straight off the shelf, tv, or some other plan. These people stop DIEting and start LIVing. I don't know what your personal truth is. I can only speak of and write about mine. I'm a compulsive overeater. I'm an emotional eater. I'm a stress eater. I'm a celebratory eater. I'm an addict whose substance of choice isn't served exclusively at a bar and it isn't secretly sold in the back alleyways. It's food. And that doesn't make me any better of an addict than anyone else--not to compare, but my addiction is just as lethal as others--the only difference is the speed it proceeds. My food addiction, more specifically, is about certain food substances--for me, clearly refined sugar--and my personal list of trigger foods--some of which do not contain refined sugar--but they dance for me if I let them. My dealer is the unwitting individual working the drive-through. So what's the key?? Well, in my experience--and again, that's all I can draw from--there are several different cuts to the key. As Jordan Burgess referred to it on episode 13 of Transformation Planet, "an unwavering commitment to self-honesty." That right there is the pivotal cut--without it, nothing works. Another cut--is extending love, self-compassion, and a healing level of forgiveness to ourselves for where this road has led us--and all of the things we did or didn't do along the way. The struggles and successes have a common denominator: They're all opportunities to learn. That's it. What went well? What didn't go well? It's a study every single day. It's not good or bad. It's not shameful or admirable--it's just an opportunity to learn how to proceed in a groove that fits us well and keeps us well. It's okay. I'm okay. You're okay. We're human. We're fallible. We're conditioned. We're experienced. We're lovely. We're beautiful. We're good people with great intentions, We have overflowing love and compassion for others--and now, for once, we can start cupping some of that overflowing love and compassion for ourselves. When we have those two cuts on the key--and we add spiritual support (whatever that is to you), accountability, and support from others who understand--who've lived it--as Dr. Marty Lerner puts it, we surround ourselves "with others in the same lifeboat," this is when this time becomes like no other time in our history. Add another cut--a style of eating--a plan that considers very personal elements of our individual truth--with boundaries in place and held with a sacred importance level--and suddenly something almost magical happens. Things start changing. And a few other things that are critically important to remember: It's about progress, not perfection. Consistency beats intensity--in other words, it's better to embrace a plan that's not only doable, it's one that's sustainable long-term instead of doing something dependent on short-lived bursts of extreme intensity. Always remember--our continued peace and calm isn't guaranteed and it isn't found on the scale. It's found within the plan we embrace each day, one day at a time. If I forget this--or willfully deny it--or throw it all out the window tomorrow, I'll return to over 500 pounds without question. And I'm very capable of doing that. I'm capable of not doing it too. But--I'm much more experienced in the chaotic stream of the struggle than I am the softer flow of peace and calm. My continued success doesn't come from the words I speak, the words I write, or the personal truths I've discovered about me. It's the things I do each day in service of the mental, spiritual, and emotional transformations, that give me the best shot at another day like today. I don't "diet." And I don't have to diet. My body weight will follow and reflect where I am within my daily plan. I don't have to chase it anymore because it follows me wherever I go. My body weight isn't the focus, my daily plan must be the focus--because body weight is a side effect of my continued recovery or lack of recovery. I slept in beautifully today. I was excited to pull up the sleep data collected by my Fitbit because I know I had plenty of REM sleep--I was dreaming away (don't ask about what because I can't remember)--but then, I check--and discover my battery died at 1:55am. Uhg!!! The sleeping in was great. It did tilt my eating schedule today--this resulted in a lower calorie count today, but I'm no longer pressing myself to "get 'em all in." It was a low-calorie day today and those are fine every now and then. It just doesn't make sense to me to load up on calories late simply to get close to my plan boundary. I enjoyed a generous portion of watermelon as my "last food of day," instead of something more calorie dense. Mom and I had dinner out tonight. It was a good visit at dinner followed by a nice ride around town and out by the lake. Mom loves to see the lake! She's doing well these days. I did some work earlier this afternoon at the studio and had some really good support communications throughout the day. It was a good Sunday around here. I've written a bunch about the power of positive visualizations. This practice has helped me from the beginning. Positive visualizations have played a big role for me from Day 1 at 505 pounds. What I visualize has changed over the years. The first six months or so, I was trying to visualize what I would look like at a healthy weight. The positive visualizations evolved from there. I remember a trip the family and I took to the amusement park years ago--and we rode everything, every coaster--things I was scared to death of riding--but I did anyway, because I finally fit--I was no longer the morbidly obese man sitting on the bench, sweating--and watching everyone else has the time of their lives. I fit on every ride we tried. And it felt amazing. I visualized that trip many times over the course of a year or so before it actually happened. Call it a goal, call it what you will--to me, the power of the positive visualization, in detail--imagining where--specifically--I want this road to go, has been critically important to my success. The more I move along this road, the more I learn. Making sure my mind is open and my perspective is in a positive place, is paramount to my continued growth. The last nearly three years have taught me much more than the five years before it combined. I sometimes sit in wonder of what the next three years will bring. I have a lot to learn. I'm excited about learning more! I often encourage others to practice positive visualizations of where they want to go--and I mean, in every way, every sense. That practice has been a key component for me because if I can imagine it, visualize it, dream about it--see it in my mind's eye, then I start to believe it's possible. It's one of the most underrated things I've been doing since day 1. I say "underrated" because I don't give it enough credit. And those visualizations were not always positive. During my relapse regain, I had many visions of the gloom and doom in front of me if I continued spiraling out of control. My focus was finely tuned with fear of consequences from those days of chaos. And those consequences came in full force. For me, it all goes back to: We get more of what we give the most energy and thought. We attract it. We either focus on what we fear or what we dream--or a mixture of both, I suppose. I've lived examples of both sides--the good and the not good, I've attracted a whole lot of both in my life. I'm blessed and grateful now--because the good far outweighs the other. The list of health improvements is a very long list. Recent lab results were better than I expected and night and day different than my previous 500-pound years. These things are things I'd often use for my positive visualizations throughout my transformation. Take a break, close your eyes, and imagine the possibilities in as much vivid detail as you can muster--it can really make a profound difference. Sometimes in the beginning or in the middle of it, it's hard to imagine life any different than the moment--but imagining, visualizing where you're headed helps bring it to life because it serves as a powerful reminder of why you're doing what you're doing--and it also helps you believe it's possible. If you can dream it and believe it, you can do it. I started dreaming of believing in my transformation from Day 1. Tonight, I'm doing something I've only done one other time in the ten-year history of this blog. I'm featuring a guest post! Tonight's special guest is my friend, mentor, and world-class Life Coach, Gerri Helms! Thank you, Gerri! For much of my life, I waited for the other shoe to drop. That gloom and doom attitude kept me from what Michael Kelly eludes to—something wonderful happening. As a morbidly obese woman, my "something wonderful" was to lose weight. Hoping to lose weight while eating is not conducive to a perky size ten, but I had a moment of clarity (exactly twenty-one years to the day before Sean’s epiphany). I made some very significant changes which resulted in something wonderful happening. 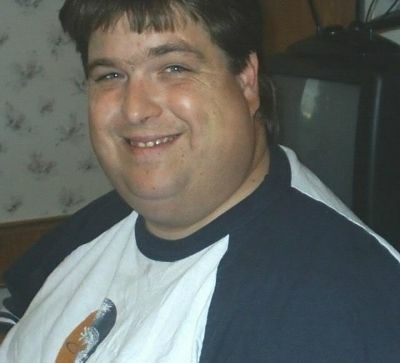 I lost weight, 100+ pounds and maintained that for the next twenty years. Waiting for something wonderful to happen greatly reduces the likelihood of anything happening. When nothing changes, nothing changes. Dreams of losing weight require taking action on a daily basis, creating a bottom line that absolutely won’t be crossed. I needed not only a realistic goal but also a good plan on how to achieve it. There would be obstacles, such as well-intentioned friends and family offering what I fondly refer to as ‘love on a plate’, but I learned that ‘no’ is a complete sentence. Obtaining a healthy body weight was just the beginning for me, the first of many wonderful things happening. I changed careers and became a certified life coach, wrote a book and retired to travel with my husband in our RV. All good stuff. About five years ago, health challenges and medication threatened to take away that one-hundred-pound weight loss. I gained some of it back while sticking to what I knew worked and did not succumb to falling face-first in a pizza, although it seemed tempting many times. I knew that if I kept doing what I was doing, something wonderful would happen again for me. Hey, I’m sixty-nine years old and have no visions of wearing a bikini someday, but I am confident that good things are in store for me. I have a new action plan, understand my obstacles and am making the healthiest body weight a priority for me. In a few weeks, Sean and I will host an intensive one-week workshop and hope you’ll join us. If you are waiting for something wonderful to happen, perhaps it is time for you to consider what you are willing to do. Whether it’s a career change, retirement like me, or even weight loss, this just might be the launch of something wonderful happening for you too. No anxiety or panic attacks last night--that was a very good thing. I think it really helped writing about it--and today, the tremendous support poured in from folks sharing with me about their experiences with this condition. Thank you, thank you, thank you. The comments, the emails, the messages--every single one appreciated. A good friend and colleague came into the studio this morning and shared with me how he too suffered for a very long time until he received a prescription that ultimately ended his regular bouts with panic attacks. It's been fifteen years since he's had one. I'm not sure if my occasional occurrence warrants a prescription but if it starts becoming a regular thing--I will not hesitate to get some kind of help. 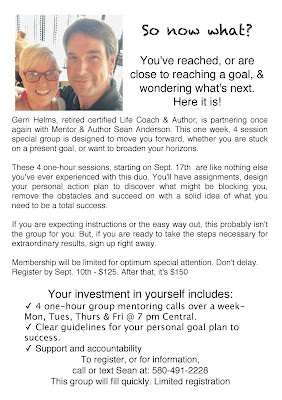 I'm super excited about working once again with retired Life Coach Gerri Helms. Our upcoming 4-day/4-hour teleconference workshop is called, "So, Now What?" If you're ready to create action plans for living and accomplishing goals other than reaching a healthy body weight, this workshop could be just the thing. If reaching a healthy body weight is still one of your goals, this workshop can help, too--but mainly, this workshop is about defining what you want and how you want to live now--and creating a workable plan for attainable and sustainable results! I didn't sleep well last night. I had an episode of anxiety and panic attacks. Anyone that's ever suffered from these, you know they can come on seemingly out of nowhere. There's usually a reason--something uncertain, something generating fear and usually irrational levels of fear. I remember going through a period of these for about a year during my standup comedy days. It would hit me every single time I was about to be announced. Heart pounding, shortness of breath, the works... and somehow, I'd pull it together and make it through the set. The first burst of laughter usually calmed me down quickly. How would the audience respond? The uncertainty created the fear. As I became more confident in my approach--and less worried about the response--more of just doing my thing, they subsided. The more I worked through them the less they were a thing until one day they simply stopped. Deep breathing...calming thoughts...it's going to be okay...this is going to go better than expected... the same practice and similar thoughts used back then, I used last night-- It didn't allow me to rest very well until somewhere in the middle of the night. I decided I needed a personal day from work--so I burned a vacation day and stayed in bed. I felt better as the day progressed. Stange thing, that attack--just overwhelmed me, was exhausting--but I'm feeling so much better now. I took care of my food plan today and as the opening "today" part of this blog states, I stayed connected with fantastic support contacts. My food schedule was a little bit tilted with a late dinner--but it wasn't too uncommon for me. "Move and the way will open." Wow. This is powerful. I've held myself back many times in life because I didn't have all the answers I felt was necessary before acting on the things I wanted to accomplish. I didn't trust the process. I wanted a measure of certainty without doing anything to create that measure of certainty. When I started successfully transforming, I was suddenly doing things differently. I didn't have all the answers--I was acting on faith. I was moving and ways opened nicely along the way. The answers I thought I needed before starting would come in the form of lessons and new information about me--good information collected as I proceeded to move forward. In the process, and in trusting the process, I started clearly seeing dynamics and perspectives that held me back for years and years. Most importantly, I also started seeing dynamics, perspectives, and practices that could set me free like never before. I still don't have all the answers. I still have many things in my life where I try to "figure it all out first" before acting. I'm great at compartmentalizing things. I can move and find ways in one area and be completely stuck in others. I will proudly wear this message as a reminder to trust the processes in my life--and most importantly, move. Every now and again someone will ask me to explain a little more about what I refer to as non-negotiables. These are different for each of us. Some might be the same but it's certainly based on our individual unique selves. What I must make non-negotiable may not be yours. Non-negotiable elements. What are they? Why are they important? Once you define the most critical elements of your plan boundaries- and you've determined they're doable on a typical day-then you make what I call an iron-clad decision. It's a promise to you from you, to give this element a non-negotiable stance come what may. Think of it as a boulder in a stream. Life is the rushing water. No matter how fast that water rushes, the boulder isn't moving. The boulder isn't sacrificed or compromised. The water has no choice, but to make its way around it- and it does. And the boulder in the stream stands strong. On a deeper level, this creates growth/development in other areas, like coping skills- it develops growth in learning what good accountability and support skills are about. The more consistency you gain, the more you'll prove to yourself that it is possible to maintain your plan in the toughest of times. And that's the idea, a plan, not a diet. You're developing a plan that takes care of what you need. In honoring your plan, you'll notice the side effect of consistent weight loss. This is what Dr. Lerner (Transformation Planet Podcast Episode 7) means when he speaks of the focus NOT being a diet, but rather, a food plan you can live with indefinitely. And it can still have the boundaries you need to feel satisfied. Especially when you reach maintenance mode and increase your calories. But again, it's all about the daily plan--and not all about the numbers on the scale. If you take care of your daily plan the weight loss will come. How important are your non-negotiable elements? It is the consistent maintenance of what you're willing to define as non-negotiable that creates growth, and in that--a natural evolution of you unfolds. Think once more about the boulder in the stream. The boulder stands strong against the current and because it does, the stream evolves--changes course, grows and with the gift of time, develops different paths and canyons. If the boulder simply moved out of the way every time the water came rushing--the stream would have an easier path--one of least resistance. In the path of least resistance, nothing changes. No growth, no canyons. I've often written about the effects of maintaining non-negotiables. The only way our food plan develops/evolves over time is by maintaining the integrity of the plan. All growth, all of our positive progress--it all depends on our willingness to create, accept and embrace certain non-negotiable elements of our plan. Determining what's reasonable is VERY important. If your non-negotiable is extreme, doesn't fit what you naturally like--is overly restrictive and monumentally demanding, it'll be a horrible experience. Make it doable for you. If we sacrifice our plan for whatever reason, the boundaries are broken and growth is stunted. If we develop a habit of consistently sacrificing the integrity of the non-negotiable elements of our plan, we literally become stuck--and often this "stuck" place becomes the very definition of insanity. Life keeps coming. And there's no such thing as a "perfect time." There's only here and now and with it, a forever fluctuating rhythm to life. Let life flow around the boulders of your non-negotiables... and with the passage of time, you'll experience growth--you'll see and feel the changes, mentally, spiritually, and physically. Developing your plan for accountability and support is important. When we decide to create non-negotiable elements of our plan, we lose a negative coping option and we work at developing supportive coping mechanisms. Excess food was always my number one coping tool, albeit not a good one. It lied to me every time--because it never fixed anything. When I developed my non-negotiables, it strongly encouraged me to either seek positive ways to cope or find other destructive ways to do it. We gotta cope one way or another. My skills haven't been and still aren't perfect, but it's a practice each and every day. Staying connected with good support and seeking out those connections in whatever way you can is critically important. There are many options available! I'm very excited to offer this 4-day/4hour teleconference workshop with my good friend, mentor, and Life Coach Gerri Helms. Gerri is retired these days--but she's coming out of retirement, like Michael Jordan or Garth Brooks!!! When someone is really good at what they do and they're passionate about what they do...it's something they must do in some form or fashion!! I'm glad she's teaming with me for this special event. Click the image above to enlarge. Call or text me for information: 580-491-2228 or email me: transformation.road@gmail.com Two folks have already signed up! We expect more. Will you join us? Space is limited! Let's discover "what's next!!" I picked up mom for a dinner and store outing this evening. It was a good visit. We discussed some good things. Rebecca writes: "I'm just starting. What should I eat? How did you develop your food plan?" I can't tell you what to eat. I believe we must create that list based on our own list of personal trigger foods, food substances that bring about a "must have more" reaction and I believe it must be based on our individual preferences. I have a very long list of trigger foods. I don't eat refined sugar because when I do, the addictive part of my brain lights up like a pinball machine. Still, I eat what I like as long as it isn't on my trigger list and doesn't contain refined sugar, and nothing I don't. And the choices I'm making are made because it's where I am, now. Key, in my opinion--is finding what works for you. Discovering what you can do, what you like and how you like it, is imperative. Finding complete self-honesty about trigger foods is most important. I don't like labeling anything "right or wrong/good or bad." Food is food. Eat what you like, just set a budget and consistently stay within the budget. If you're having difficulty maintaining the integrity of your budget, don't kick yourself--instead, look at the foods. Maybe there's something in there that needs to be on your personal trigger list. Also, trust that your choices will evolve over time. 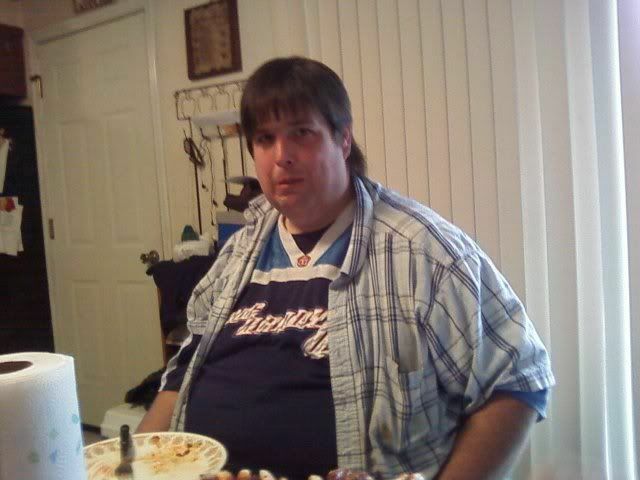 Having been 500 pounds for so long, I instinctively knew that I wasn't going to change a lifetime of habits overnight. And I felt like if I tried, it would end up another failed attempt. In my opinion, the "nothing is off limits" philosophy is still valid and important, because it allows us to be where we are, be ourselves--growing and developing in a natural, organic way. We learn about ourselves along the way. I've learned that I can't do refined sugar. My over four years of abstinence so far has made a profound difference in many different areas of my life. It's by far the single most important recovery decision I've made along the way. 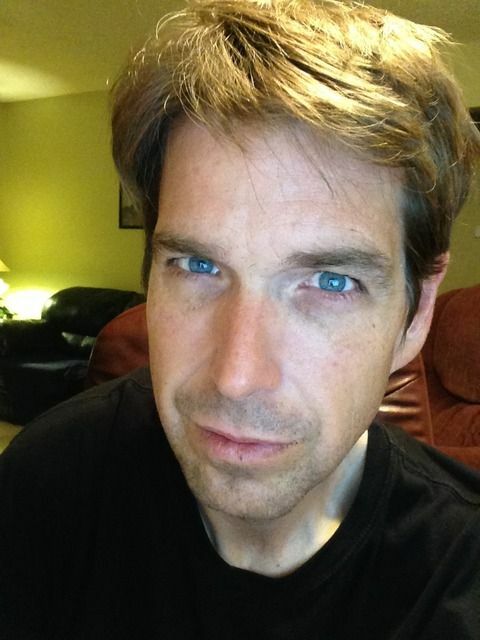 It took a 164-pound relapse/regain to arrive at that conclusion and finally releasing my denial. Some things, for me, are harder to learn. And that's ok.
Had I not crashed and burned over and over, maybe I wouldn't have found a place of acceptance for my condition. But not everybody is a food addict and compulsive overeater like me; addicted to refined sugar with four decades of experience in stuffing emotions and stress with food. Abstaining from certain food substances may not be what's right for you. In my opinion, if the greater focus is placed on the food and exercise instead of the mental/emotional/psychological dynamics--then we end up facing the biggest elements unprepared. It becomes "diet mentality." A focus on a simplistic food plan backed up with solid accountability and support has a really good chance of working well for the long haul. Recovery programs and support groups are great ideas. We don't do this alone. And please, never compare what you're eating to someone else's food. Remember, we're all different. I'm in maintenance mode with a generous calorie budget and a food plan evolved over the last ten years. My best advice is to let it go. Just be you and give yourself room to grow and develop. You be you. Ultimately, we're wanting a measure of peace and stability and as a "side effect," to arrive at our healthiest weight--and if we arrive at a healthy weight range for our body--and along the way our health improves dramatically--and we do it in a way that fits us, individually--then we've successfully shifted the focus away from the old diet mentality--we've accepted and embraced the plan we've created specifically for us--and now, how does it all compare to the pre-planned diets of old?? The ones that were nutritionally sound but lacked a human consideration--the ones difficult to sustain--the ones challenging our addictions, compulsive food behaviors, and ultimately, our ability to remain consistent?? I'm not a nutritionist or a dietician. I'm not an expert. I just have my experience. I will say this-- our food plans don't mean a thing if we're not willing to do the deeper work. It doesn't matter how many years I've been at this, I humbly admit-- I don't "got it." It takes a daily practice and a willingness to be open to recovery based perspectives in order to break the diet mentality. I've got a long way to go with my recovery. But I'm going. I assure you, I'm going one day at a time. I slept in exceptionally well today. It was absolutely fantastic and needed after yesterday's schedule. One of the big perks of working in radio is getting free tickets to concerts. I don't always take advantage of it, but I did tonight for Sugarland in Wichita! It was an amazing concert!! It was good to have an evening off! My sleep stats on this Fitbit are revealing. I have no idea how it works but it seems to work pretty accurately as far as I can tell. These stats have inspired getting an overnight oxygen saturation test very soon. The information will help make the decision whether or not to get another sleep lab--just to make sure I'm doing okay when I sleep. Today was one of those rare days where the schedule turns out to be a little much. I started the day with my morning show at 6am, worked until 4pm with a five-hour location broadcast, grabbed a 45-minute nap, then worked an emcee/dj gig for the chamber of commerce Party At The Palace, an annual fundraiser event at the historic Marland Mansion from 5:30 until after 11pm. I finally made it home not too long before midnight. My body aches!! I'm going to sleep very very well tonight--and I'm sleeping in, for sure! I took care of my food plan today--making sure I had a plan in place. I ended up not needing my backup plan at the event tonight because the food was workable within my plan boundaries. 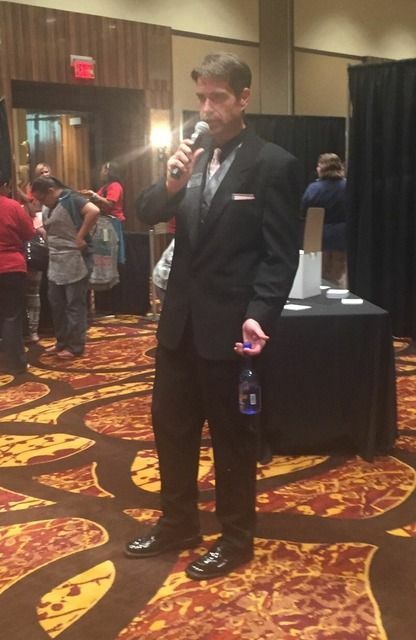 I've emceed/dj'd this event for a few years, maybe four in a row--I can't remember, maybe only three--but again, it's one of those events where my continued stability in maintenance is noticed by people. One person came up to me tonight and said, "you're still maintaining your weight loss!" It was a compliment, certainly. But it also reminded me of how it isn't a common thing. It seems almost expected for people to regain and when they don't, it's a surprise. I think, for those of us who must approach this from a perspective of a daily practice in recovery instead of a diet mentality means to an end, we have the best chance at becoming uncommon. Not because we're special or different, but because our perspective is special and different. I have a deep respect for the fragility of it all. I know how easily it can all go the other way. I'm not immune to going back. I must continue to be diligent in this daily practice. In fact, I'm currently actively and willingly exploring ways to strengthen my daily practice--Because I don't want to lose the freedom I've gained--and I want to expand into freedoms I haven't fully explored. I ran into an old friend tonight. This guy has known me since the very beginning--before I started, actually-- He's known me for fifteen years. He showed up at tonight's event 170 pounds lighter since last time we were in each other's company. It was the greatest thing. We had a brief conversation about this whole transformation stuff-- about the daily practice perspective for long-term sustainability...and then he paused for a second...and said, "what you just said-- that's it, part of me wants to hit you and the other part wants to hug you." Truth is hard to hear sometimes. It can also provide a measure of emotional freedom--the kind that feels cleansing and makes you want to hug people tightly. We hugged. It was good. Today: I maintained the integrity of my maintenance calorie budget, I remained refined sugar-free, I met my daily water goal, I enjoyed a great elliptical workout at the Y tonight, and I stayed well connected with exceptional support. I've looked at the pictures over and over, and it's strange, but I really do kind of miss that guy. I "get it." That guy was affected in so many different ways. Ok, I need to stop talking about my previous physical appearance like it was someone who passed away. But, in many ways, it is just like that. I look at "Before" and "Now" pictures with a perspective focused on the innate, common qualities of the individual. I see one person. Not two. My happiness is no longer found in external sources. My happiness is found and was always available for discovery, in the core elements of me. 505 pound me, then and 214 pound me, today--same person, same core elements and the same opportunity for happiness. Today: I maintained the integrity of my maintenance calorie budget, I remained refined sugar-free, I met my daily water goal, I did a 20-minute stair climbing workout tonight, and I stayed well connected with exceptional support. I had a rare midweek/midday location broadcast today from a fast food restaurant's customer appreciation day. My plan was to stick with water and enjoy a late lunch when I got home. I declared the plan to a couple of people--and I stuck to the plan. I was offered complimentary food. I politely declined. My food plan is too important for my continued wellness. Now, with that said--I could have, in a big pinch, ordered a burger without the bun--wrapped in a lettuce leaf with mustard, certainly...but I didn't want that--and my breakfast held me very well until I could get home for some better options. Wednesday is my busy day where I try to keep this post short. I promised myself a good workout tonight. "Good" is a relative term--to me, a twenty-minute stair climbing routine just outside my front door was perfect; better than good. I accomplished a lot at work today. That always feels good-- productive days, in general, feel better than unproductive days! I also did some much-needed cleaning in my apartment! Mom and I enjoyed dinner out this evening. She's been showing off the Health Monitor Magazine story to every person where she lives. She's a proud momma, for sure! My oldest grandson, Noah starts kindergarten Thursday. I can't believe he's five years old! Time moves quickly, doesn't it? I love him so much! I'm looking forward to hanging out with him again someday very soon! When I look at him and my other three precious grandkids, I'm reminded of why I do what I do each day. This daily practice is about much more than maintaining a relatively healthy body weight. It's about having the best chance, God willing, to be there for them-- to experience life in ways I didn't back in the days when I was constantly "in the food." Honoring the boundaries of my daily food plan helps keep me well. It's not everything. But it's a big important part. When I'm maintaining the integrity of my daily food plan, it allows a freedom for me to live and experience life in a more present way. Busy night! Keeping this edition short. My mom has a long history of buying magazines with weight loss stories and various weight loss related articles. We had piles of 'em around the house when I was a kid. I've read hundreds of personal stories over the years. She occasionally asks me to bring her the latest Women's World or, if we're at the store together, she'll gravitate over to the magazine racks and pick one out. One thing is certain--if mom buys a magazine--the headline is about weight loss in some form or fashion. It was very cool to take mom a magazine featuring me and my story. The Health Monitor Magazine Guide to Weight Management issue includes various articles and several stories. I was honored to be featured alongside David Garcia, better known as "Keep It Up, David!" Health Monitor sent a few complimentary copies my way. Mom enjoyed that. I'm glad. You can find the magazine in the waiting room of doctor's offices and hospitals across North America. I'm full of gratitude. Goodnight! Today was a wonderful day! I had the opportunity to meet up with my longtime friend and mentor, Gerri Helms! If it wasn't for Gerri, there's a really good chance I wouldn't be here to write this blog or do what I do each day. She would be the first to say, "you're doing the work," but seriously, even in my darkest periods along the way, she never gave up on me! Much love and gratitude, Gerri! We dined at a Mexican restaurant this afternoon. It worked perfectly for my food plan--the old standby, fajita crispy tacos, works for me! It's been a really long day. I'm hitting the pillow! Today was a fairly involved workday. I started with a broadcast from a big event at a grocery store. It was the Massive Meat Sale and Hatch Chili Roasting event. I've mentioned this several times--it's always a great thing to combine working with bargain shopping! My favorite petite sirloins were on sale--so of course, I grabbed some!! The store set records today--so it was a successful event! As a board member of our local arts and humanities council and in consideration of what I do for a living, I regularly make the opening announcements for special concerts we bring to town. 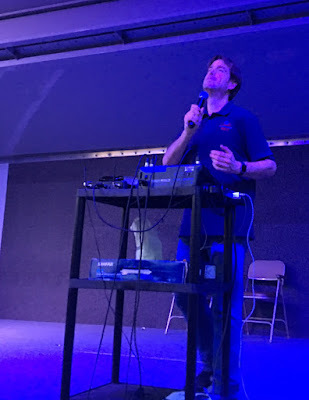 Today was two performances with Emmy Award-winning television personality Lucas Ross, at 2 and 7:30, I made the announcements and introduction for each show--and then, since our studios are conveniently located in the front of the theatre, I proceeded to get a bunch of work completed. I prepared some great food today. I stayed connected with support friends and feel pretty well. I'll be traveling tomorrow to visit my longtime friend and mentor, Gerri Helms and her husband David as they travel through our state. It's a rare opportunity and I'm not missing it! Plus--just a teaser-- but were planning to do a project together in the near future. I'm excited about that! More information on that, soon, I'm sure! I've spent a lot of time writing about time--and how it passes and how it does what it does regardless of what we do. The passage of time can bring a pleasant surprise or crippling regret. I've worked to maintain a perspective that doesn't worry too much about time. I'd rather not give time too much power over my emotions. There was a time I did--oh yeah, all the time--I was worried about time. One of the first questions I obsessed over years and years ago, before finding this road, was, "How long is this going to take?" It was a loaded thought because maybe I was looking for reasons I couldn't do this--and some genuine frustration with an equal measure of discouragement was all I needed to jump into the "poor me-I've got it too hard--it's too overwhelming--look away, I'm hideous and hopeless" thought process. The only way I was able to let go of this discouragement disguised as a motivator, was by bringing the focus back to the here and NOW. And in focusing on maintaining the integrity of my plan each day, I was able to find something I could immediately feel great about. If I maintain the integrity of my plan--and I hit the pillow knowing I nailed a great day-I feel calm and confident. When the challenge and reward share the same 24 hour period, I end up feeling great. Back when I would set the challenge and reward a year apart, I never made it too far. I need positive reinforcement. Like a dog in training, I need little "brain treats" daily. Today was a very involved day at work. Tomorrow starts with a broadcast from a grocery store's massive meat sale and Hatch Chili roasting event. It'll be great! Oh, I'll be doing some shopping while I work, believe me! I once again have a Fitbit activity tracker. Now, I'll have undeniable proof of my lacking exercise schedule. Wait--that's not a positive perspective, is it? Uh, I mean--now, I can get into tracking my workouts and this, I believe will inspire a more consistent schedule. Incidentally, after taking forever to get it set up, including a call to their support line--which by the way is absolutely fantastic, then dinner, a store trip, and taking mom some things she needed, I didn't make it to the YMCA this evening. I don't need a Y visit to exercise, of course, but it just became too late. The 4:30am alarm comes way too soon. So--I'll take getting my Fitbit setup as tonight's win. I bought a watermelon tonight. Always a gamble--and it paid off! It's a good one. It was tonight's dessert (see Tweet below). Tonight's flashback goes all the way back to 2009, more than nine years ago. Everything was so brand new back then---and my positive visualizations were starting to happen with my dramatically smaller size. This DDWL Flashback takes us to the lake--on a SeaDoo for the first time. The owner of Team Radio had invited me to his private dock to ride his Sea-Doo jet ski no less than five times over the last month or so. Today I decided I would do it. Doing things like this that were once nearly impossible is one of the quickest ways for me to get really emotional about how far I've come in the last 313 days. This is what it's all about. It's living, my friend. Really living. You know what I mean? Feeling that jet ski lift up and skimming across the water as the wind hurried through my hair was simply amazing. I felt like I could fly. As I rode atop the surface I thought about how things have changed for me and continue to change. It would have been so easy to never have started on September 15th of last year. I did that my entire life. You know, think about starting, even plan to start, get excited about starting and then when the day would come (always a Monday for me), nothing but fear and giant overwhelming feelings of I can't, it's going to take too long, how am I going to do this under so much daily stress? It certainly wasn't that I didn't want it---Oh I did...but I was so busy trying to complicate the process, I couldn't get a handle on figuring out how to really do it. I always claimed, “Oh, I know how to lose weight---just eat less and exercise more.” But there's more to it than that. Until I really analyzed the psychological part of the equation, I couldn't solve the problem no matter how bad I wanted it. This time is certainly like no other for me. It's the real deal, my friend. The way out was found because I completely surrendered the dishonesty within, the excuses, and the rationalizations that always gave me reasons to fail.